I should have written this a long time ago. Back when I felt it stirring in my heart. Back when the words began burning in me so hot I could barely stay seated. Back when it first kept me up all night. I apologize for making excuses and finding distractions. I’m writing it now. When I look around the Church – general church, not any specific congregation – I see something troubling. Or rather, it’s what I don’t see that troubles me. I see a sea of faces, similar to mine. Families greeting each other, all resembling one another. Friends hugging and chatting and relating to one another as they embark on nearly identical life journeys. This is not a bad thing – we are the family of God, and fellowship is a powerful thing. What troubles me is how alike we all are, mostly two-parent, white families of comparable socioeconomic standing. Again, I’m not saying there is anything wrong with being a white, middle class family, no apologies are to be made for who you are. But I know that this fellowship, this flock, is not a representative sampling of our city, of our world. Where are the families of different colors, cultures? Where are the single parents? Where are the single people? Where are the addicted, the poor, the broken, the unemployed, the homeless? Where are the gay people? Where are the trans people? Where are the families with two moms, two dads? THIS is what our world looks like. THESE are the people we don’t have sitting beside us. The Church is not our mirror – it’s God’s. It was never meant to reflect our own image back to us, it was intended for God to see His reflection in us. If we only fill the pews with people like ourselves then we have not furthered the kingdom, we have only created a mirror. If the only people you know live lives exactly like your own, then please, meet new people. More people. Hurting people. Different people. People Jesus died for and longs for. People who He created with as much care and loves just as much as He loves you. Here comes Justification Jones, ready to argue. Show me someone who isn’t. Show me a parishioner who does not struggle, who did not come to Jesus as a sinner. If you think being a sinner precludes anyone from meeting Jesus then I’m sorry to say you’ve read your Bible wrong. God knows when sin is present, He knows what His Word says. He does not need our opinion of His children. He’s not interested in our judgement of them, He’s interested in their hearts, He’s desperate for their company. Becoming a Christian, as you as Christians will know, does not make us perfect or suddenly insulate us from a world full of hurt. On the contrary, becoming a Christian means we are called to go out into the world and make His name famous. His blood was as much for their sins as it was for ours, and we are cheating His sacrifice on the cross by keeping it to ourselves. A few years ago I shared a story on Facebook, an experience that really opened my eyes. I was photographing two beautiful brides, the southern tradition of bridal portraits, stunning blondes in gorgeous gowns. They posed fantastically and created some of my favorite images to this day. They were young, happy, and in love. Unbeknownst to the onlookers and gawkers around us, they were also sisters. Their weddings were not far apart, and it was a unique opportunity to capture their friendship during this special time in their lives. But what I knew to be two sisters sharing a memory looked to outsiders to be two women in a romantic relationship. Let me tell you, we got some looks. Pointing. Scowling. People flustered with their disapproval, not knowing what to do with the judgement that washed all over them. Ugly looks. Mean looks. Mad looks. Attention is normal during bridal portraits, it comes with looking like a princess in an ordinary world, and ordinarily every bride is greeted with smiles and congratulations, maybe a few inquiries as to the big day. But not this day. Only one couple stopped to admire these ladies’ beauty and offer their congratulations – two men, arm in arm, out walking their dog. I don’t hate the Church, don’t misinterpret me. I love my God and His people and have been involved in full time ministry for more than 13 years now. I just want better from the church. That day I saw that we as Christians had been getting something very wrong. None of those looks, those scowls, not one furrowed brow or pursed lip made me want to go to church. I did not feel invited, welcomed. I felt judged, felt outside. I could see the disapproval on their faces and knew our company was not anything that interested these people. Their opinions of us were more important to them than our souls. Friends, we cannot hate anyone into church. We cannot judge them into the altars. We can, however, shun them to the point of preferring whatever eternity awaits them beyond the arms of Jesus. We’re getting it very wrong when it comes to the LGBTQIA community. “That’s a lot of letters, Jen,” says Justification Jones. And Jesus cares about every single person they represent. If a new letter is added tomorrow, I will learn what I can about it so that I may better embrace the person who identifies with it. If a single parent, a gay person, mentally ill person or an addict gives me the time of day, I want to embrace them with all the love I have. I want to be able to say, “Historically my people have not been too kind to your people. Please, sit by me and get to know Jesus.” If a person comes to me and says they used to be a man but now they’re a woman, I will say to them that I once was lost but now I’m found, welcome to our church. At some point, someone somewhere took it upon themselves to categorize sin and create something Christianese calls “lifestyle sins”. I’ve got news for you – that’s not a thing. It has no Biblical basis. When we embrace the adulterer and tax cheat but turn our hearts against the gay community, it has nothing to do with “lifestyle sin” and everything to do with moral superiority and relativism. The moment we start to compare sins we have stepped outside of the word of God and into our own opinions. It is not and never will be our job to excuse or condemn. Justification Jones will point out that the Bible gives clear instructions about confronting sin within the church… within the church. What good is it to confront a nonbeliever with words he doesn’t yet believe? The Bible is not a billy club and the gospel is not to be earned. It is free, to all. Spread His love and let Him do the talking. When the woman was caught in the act of adultery and thrown at the feet of Jesus, it was by judgmental men who rebuked her every step of the way. She was brought to Him not to save her, but to condemn her! You know from the account how well it worked out for those who brought her – they left in their own shame, having become aware of their own sins and how little the woman’s affected them. The adulterous woman, escorted in judgement, left in freedom; the would-be jury came in haughtiness and left in humbleness. 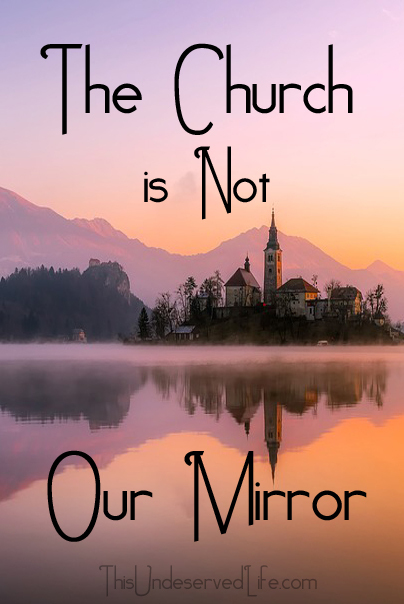 The Church is not our mirror – we are His. We are vastly underqualified to decide who should and should not come to church. The judgement throne is not our pew, friends. We need more of the people outside of the church, sitting in our church. We need to check our hearts and pray for theirs. We need to reflect Jesus and stop trying to be Him. Heaven isn’t hiring, it’s welcoming. The job we were offered wasn’t that of judge and jury, but of missionary and mouthpiece. There is not one single justification that anyone can muster which would excuse someone from being invited to church. We need to reach His people and serve His people. We as the Church need better divorce care, better single parent support, better foster family respite care, better, qualified, professional counseling services (expect another blog on this in the near future). We need multicultural congregations and multieconomical outreach. We need more welcomes and fewer stares. We need Jesus to be famous. We need the world to hear His good news. We need to open our arms, shut our mouths, and just hug any person Christ would…. Previous Previous post: Pause. Take a Breath. And Choose a Child’s Life Over Irritation.